Mr Widjaja’s article emphasises that for Indonesia to achieve economic stability there should be ample supply of sufficient energy to the archipelago. The article highlights the implementation of state-owned company Pertamina’s "one price policy", by which it aims to provide the same fuel price throughout the country. Furthermore, the article calls attention to Indonesia’s need to assert itself on the international stage, by means of improving and forging new diplomatic relations. Through this course of action, Indonesia will gain access to potential markets for its energy and financial sectors. The article therefore recommends that the government maintains and further develops sectors of the economy which have the potential to become a breadbasket for Indonesia in its efforts to achieve long-term self-sustainability. 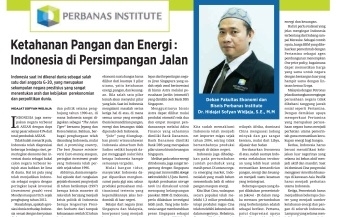 This article demonstrates Perbanas Institute’s latest initiative to take stock of Indonesia’s economic potential as well as provide meaningful insights into channels through which further growth can be achieved, such as through the development of the aforementioned three key sectors. With the emergence of the ASEAN Economic Community, Perbanas is keen to ensure that Indonesia takes steps to become self-sustainable, so as to compete with its regional counterparts; this will continue to be a priority area of focus for Perbanas Institute going forward.